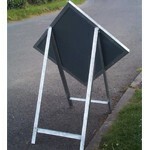 Temporary Roadworks signs need to be versatile, visible, and quick and easy to set up. Our toggle-mount system for affixing signs and supplementary plates provides a user-friendly method of quickly and safely changing the sign. This system is extremely cost effective in allowing a range of different signs and plates to be used on a single stand.